Having returned from a little mini-vacation we are back with more news of Furry Stuff coming up. 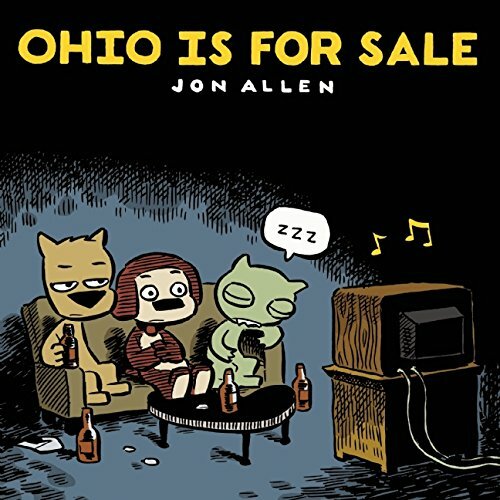 Here’s one from this summer we missed: Ohio Is For Sale, a black & white comic by Jon Allen. “Three cartoon animals live in a house together in the American Midwest. They get a job, get sick, and throw a party. Their lives are lit by street lamps and the flickering TV set. They do incredibly stupid things with hilarious and disastrous results. It’s about friendship, booze, and the slow collapse of western civilization. And they’re so cute!” After Jon self-published several issues of Ohio, now Alternative Comics is offering his first compilation in trade paperback. Visit his web site to catch up with the latest, too.